Mosques Consider Sanctuary For Immigrants A year ago, a Cincinnati mosque said it would be a sanctuary for asylum seekers — and backed out three weeks later. Now, mosques continue to explore ways to be involved in the sanctuary movement. 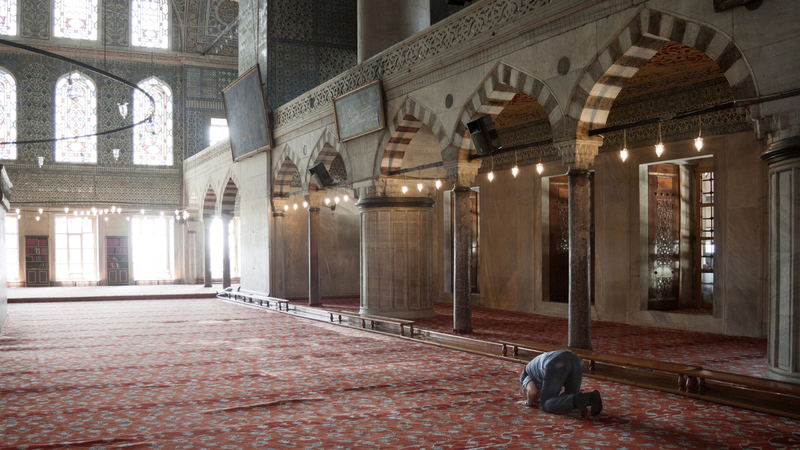 An old man prays inside Sultan Ahmed mosque in Istanbul, Turkey. That was a cornerstone of Trump's campaign platform, and after his election, officials at a mosque in Cincinnati announced they intended to become a sanctuary congregation, ready to shelter asylum seekers or migrants in need — whether Muslim or not. But just three weeks after the election they backed off that offer of providing shelter within the mosque. "So I think that announcing yourself as a sanctuary has its implications, whether you're a mosque, a church, a synagogue, or anything," Imam Omar Suleiman told NPR's Renee Montagne. Suleiman is the founder and president of the Yaqueen Institute for Islamic Research near Dallas, Texas. He says ICE has been particularly aggressive in Dallas, where the area leads the country in the number of deportations since the election of Donald Trump. "I think the tools that have been employed against immigrants are the same tools that have been employed against refugees, which are the same tools that have been employed against the Muslim community as a whole, which is the dehumanization — the 'otherizing' — that allows people to subconsciously accept this idea that we somehow do not deserve the same level of dignity and respect and liberty that everybody else does," Suleiman says. "The idea here is that the goal of sanctuary is to provide safety, and if we cannot provide emotional, physical safety, then it would sort of be defeating the purpose," Suleiman says. "You know, there are other ways to express solidarity and support but announcing your particular mosque as a sanctuary could potentially endanger that particular Muslim community and then obviously the immigrants themselves that would seek shelter would be under that intensified scrutiny." NPR's Digital News intern Asia Simone Burns produced this story for digital.